Gamma is a new hotel concept that combines the best of two worlds--the charm of a small local hotel and the backing of the Fiesta Inn chain. 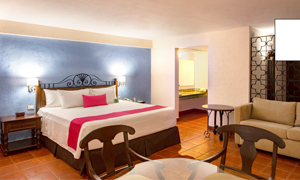 In these spaces designed for a unique stay, feel the warmth of our service and enjoy the thrill of being in a destination with the taste of Mexico. Cherish many unforgettable moments at Gamma by Fiesta Inn Mérida El Castellano. 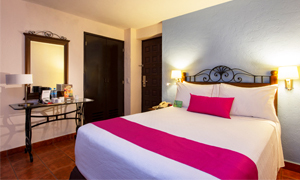 The hotel is located in the historic downtown district, where the flavor, magic, and extraordinary richness of the Yucatán culture resides. It features 160 comfortable guest rooms, a business center, fitness center, swimming pool, restaurant, bar, and fully equipped meeting rooms for work groups and special events. 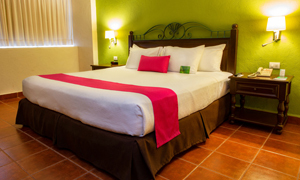 Gamma by Fiesta Inn Mérida El Castellano is an Eco-friendly hotel, so it is a 100% smoke free hotel. Delight your palate with the best of Mexican and international cuisine as well as regional food from the Yucatan in El Salmantino, known locally for its delicious buffets and traditional dishes. Relish the flavor of home in a charming ambiance with warm personal service. If you have work to do, Gamma by Fiesta Inn Mérida El Castellano offers fully equipped and professionally staffed meeting and event spaces with everything you need for a successful conference, seminar, meeting, convention or other special event. Meeting rooms are fully equipped and can accommodate from 90 to 200 guests. There is also a business center with computer work stations and everything you need to stay productive while on the road. "To discover Mérida's historical downtown"
Excelent location of this hotel, walking distance to most emblematic places in downtown (Main square, cathedral, Montejo palace, Santa Lucía,...). Very good facilities and, most of all, the warm kindness and helpful attitude of all staff. "Great location near the Plaza downtown inside the city wall"
Look for the pink high rise downtown near the plaza to find the Gamma hotel. The staff are very friendly and accomodating. Try the fruit juice located in the lobby. They had watermelon juice chilled while we visited. Just 2 blocks from the Plaza, you can find anything you want to purchase close by. Many restaurants are close by or just stay at the hotel restaurant for a great lunch or dinner. Our rooms came with free breakfast buffet which is different than normal breakfast food only. The full buffet includes any Mexican food black beans, meat dishes, paealla, sweet plaintains and made to order omelets. The room was very comfortable, but not overly large. Bathroom was nice size and the shower was very nicely shaped with very hot water if you want it. Bottle waters are included in the room, one free per room. Elevators require your room key to access any floors. The pool area is beautiful and covered with beautiful flowers and gardens. Lounge chairs around the pool make for a great time to relax. We stayed at this hotel by the end of February, all staff was so kind and attentive. Special thanks to Eddy and his restaurant Staff for making us feel at home, helping with the high chair for the baby, taking to the washer baby bottles and even taking care of my son’s lovey when forgotten at restaurant. Food by the way is good and tasty. Location is a plus, close to main square and surrounded by many commercial streets with restaurants, convenience stores and shopping. 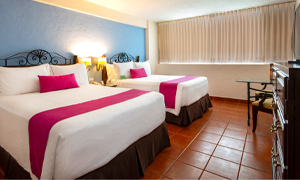 Hotel is well maintained, clean and enough as you spend most of the time out touring the city and surroundings. "You better lock your suitcase when staying in this hotel"
We stayed in this hotel for two nights. The first evening in Merida I wore a long sleeve martime style shirt. The next morning I packed it back into my suitcase as I wore something else during the day. In the evening I wanted to wear my maritime style shirt again and could not find it any longer. It had disappeared. The next morning I went to the reception and asked for the supervisor of the housekeeping staff. The supervisor lady came to the reception and I told her that my shirt had disappeared from my suitcase. She told me that my shirt might have slipped into the sheets. How can a shirt find its way from a suitcase into the bed sheets?? She promised to check it with our housekeeper. In the meantime I went for breakfast. The breakfast in this hotel is more a brunch then a breakfast. You find lots of hot dishes there but bread and butter were missing most of the time. When I came back from breakfast I asked the receptionist if they had found my shirt. She told me that they had checked with the laundry but my shirt was not there. The hotel did not make any efforts to compensate me for my loss. So, Claudia, I hope you look stunning in my shirt! Everything you need is here for a magical stay in our Master Suite. This room has 2 connecting rooms. One room has 1 queen size bed and own bathroom with tub; and the other room has 1 double bed, a Murphy bed (folding bed) and private bathroom with shower. Each is equipped with hair dryer, closet, coffee maker, 32'' LED TV, air conditioning, electronic safe and wireless internet. This is equipped with a living room with 32'' LED TV, a Murphy bed (folding bed), dining area, full kitchenette. It also has 2 separate bedrooms, 1 with king size bed and one with 2 double beds each with own bathroom, air conditioning and wireless internet. Share your stay in this spacious and functional space where can accommodate up to eight people.